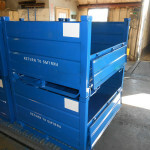 Welcome to Benchmark Tool & Machine, Inc.
Steel Bulk Containers are available in both rigid and collapsible styles. They are fabricated using high-quality, durable steel and they are powder-coated to our customer’s specifications. 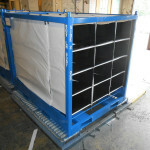 Bag racks can be custom built to hold one large super sack to several individual bags to hold delicate, Class A parts. 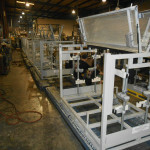 Let our experienced team design a specialty bag rack for your project. High quality and heavy duty. 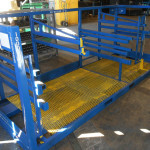 Our pontoon trailers are fabricated with highest grade materials, designed for low maintenance and long life. Benchmark Tool & Machine is responsible for creating custom shipping containers for several of the largest Japanese and Domestic automakers, as well as Tier 1 and Tier 2 suppliers. 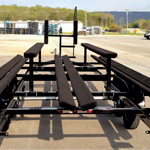 We have added a new product line, pontoon trailers, using our craftsmanship and skills in developing and producing a well-made and sturdy trailer. Our equipment consists of an excellent blend of classical and modern machinery. ISO 9001:2015 Certified. With over 200 years of collective experience, we produce high quality metal racks, containers and pontoon trailers on time and at competitive prices. We do this with the support of our skilled 100+ employees in a high-volume production environment. Our 60,000 square foot facility is located in Pelham, Tennessee just minutes from I-24, with easy access to Chattanooga, Nashville, and other major cities. For all inquiries please visit our Contact Us page.